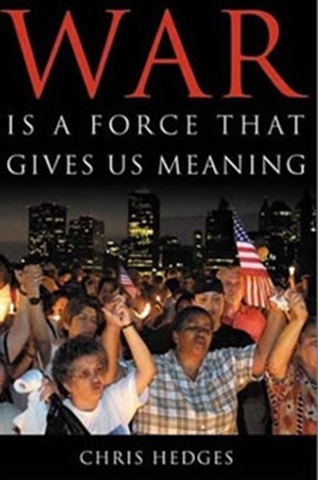 I like the premise of this book (well, given the subject matter, “Like” is not the best term), but here Hedges gives us some “reality” to weigh against the glorification of war in our culture. Charlie’s post from the other night about challenging the myth of “there are no soldiers who die for the wrong reason”, also challenges this myth. And yet there is a part of me that remains nostalgic for war’s simplicity and high. The enduring attraction of war is this: Even with its destruction and carnage it gives us what we all long for in life. It gives us purpose, meaning, a reason for living. Only when we are in the midst of conflict does the shallowness and vapidness of our lives become apparent. Trivia dominates our conversations and increasingly our news. And war is an enticing elixir. It gives us resolve, a cause. It allows us to be noble. And those that have the least meaning in their lives-the impoverished refugees in Gaza, the disenfranchised North African immigrants in France, even the lost legions of youth that live in the splendid indolence and safety of the industrialized world-are all susceptible to war’s appeal. What I am struck with in this account is how miserably the church in our country has failed to fill the void that exists ; the void of anonymity that is advanced by consumerism and rampant individualism and the gnostic-like narcissism of individualized Christianity, which makes it possible to have a “Church” that “gives away” (ala Fitch’s The Great Giveaway) its role as a community called apart to be in contrast with the culture, and instead gives its blessing to a patriotism that exalts wartime as a time when we “all know what is most important is our freedom”, and gives us a “shrine” at which to worship which cynically taps into the need we have for meaning. Constantine replaces Christ, and the myths of nationalism override the Kingdom that stands in direct contrast to the empire. This entry was posted in Uncategorized and tagged PeaceChurch, SocioPolitical by Theoblogical. Bookmark the permalink.